With a front-wheel drive design that's quiet and gives you smooth motion, the E7.1 Elliptical from NordicTrack is a favourite for those seeking a great way to exercise at home. With adjustable stride length, this elliptical can suit you stride regardless of your leg length, while advanced digital resistance and an inertia-enhanced flywheel offers an incredibly fluid and dynamic feel. This elliptical is small enough to fit in your home, but rugged enough to take you on a challenging workout. Move your arms and legs: Burn more calories with upper-body workout arms. Featuring soft touch, multiple position grips that accommodate any height, these workout arms are easy to hold and keep you comfortable throughout your workout. Adjustable Ramp: As the ramp incline increases, the stride length automatically increases from 19 to 20 inches to maintain a fluid, natural feeling stride. Target and tone your calves, hamstrings or thighs. The 5 position adjustable ramp angle adjust from 3 to 20 degrees to change the shape and length of your stride to work different muscle groups. You can optimise muscle toning all while maintaining great comfort and traction control for stable, relaxed movement. Easy-to-use Console: Quick, responsive, OneTouch controls adjust your resistance to burn more calories. Silent Magnetic Resistance: With SMR Silent Magnetic Resistance, every adjustment is quiet, smooth and natural. Inbuilt Programs: Get the workout you want with 20 options for you to select from. Each workout is designed by a certified personal trainer and automatically adjust the resistance of the elliptical to maximise your training time for faster results. The simple navigation on the console makes it easy to pick your workout and get moving. Heart Rate Training: Stay in your target heart rate zone for better results. Sensors for the CardioGrip™ Heart Rate Monitor are built into both handlebars for a quick, accurate reading. 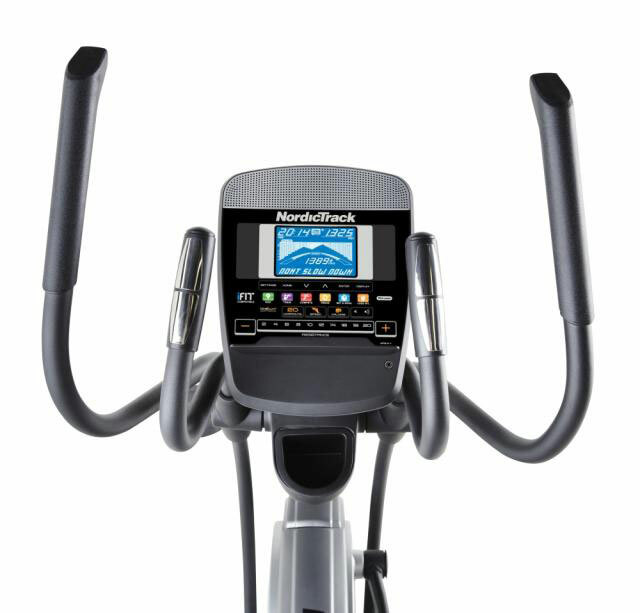 Strong Steeel Frame: Made from commercial-gauge solid steel, the NordicTrack E7.1 Elliptical machine is built to last. Water Bottle Storage: Stay hydrated throughout your workout by keeping your water bottle close. This convenient water bottle holder is built-in for easy access. Transport Wheels: Quickly move your elliptical from room to room with built-in, front-mounted transport wheels. Magnetic Resistance: 20 Digital Resistance Levels. Stride Length: 20" Adjustable Stride Length to cater for taller or shorter people. Inbuilt Programs: 20 Workout Apps for variety. Pulse and Heart Rate Monitor included. Adjustable Stride angle: 3 to 20° Target Toning Ramp. Comfortable, over-sized Pedals - suits every foot size. Soft Touch Upper Body Hand grips. Feet Levelers - suitable for an uneven floor. User weight Capacity: 135 kg. Assembled Size: 170cm (L) X 46cm (W) X 169cm (H). Elliptical Product Weight: 73 kg. Buy NordicTrack E7.1 Elliptical cross-trainer from Fitness Market and save! With our efficient dispatching and quick delivery throughout Australia, NordicTrack E7.1 Elliptical cross-trainer can be yours sooner. Below you can rate and add reviews for NordicTrack E7.1 Elliptical cross-trainer. Nice elliptical to replace my old one. I've used it everyday since I got this new one. It's great and am happy with my purchase. Thanks guys. Happy with the e7.1 machine. Thanks for your help. happy with it, thanks for your help.